Following a passage on the New Covenant, the Apostle Paul, wrote “Therefore, since we have this ministry”. Therefore is such a powerful word in Scripture. Paul is saying, since we have the ministry of sharing the Good News of the Gospel, we do not lose heart, or abandon your commitment to the Gospel like a coward. That is the ministry of Tammy and Cletis Titus. Their hearts are so committed to sharing the Gospel that obstacles are not roadblocks to ministry but platforms on which to proclaim the goodness and love of our God. As I pray for them, I thank God for giving them the ministry that they have. The difficulties that they encounter, have not served as reasons to walk away, but as opportunities to show the grace and mercy, power and strength, love and care of our mighty God. They face difficulties and discouragement but don’t lose heart because they rest in Him. Please God, remind them of your power and love when struggles come. I also want to pray, thanking you for their faithfulness in proclaiming God’s Word. They share a love for the Word, and love to share that love with those they are ministering. From faithful preaching of God’s truth, to the training of new converts, they give God’s Word. Please God help them when sharing Your Word. Then God, I pray for those to whom they minister to have the light of the Holy Spirit cast upon the Word. I pray that the influence of Satan, the god of this world, would be curtailed and that You would prepare hearts to hear and receive the Gospel. Help Cletis and Tammy be guided by Your light and give them wisdom to see life the way You are looking at it. Help them to continue to preach Christ and to make Him the star of their ministry. The One who spoke light into existence, will shine in our hearts to give knowledge of the glory of God as that glory was in the face of Jesus. 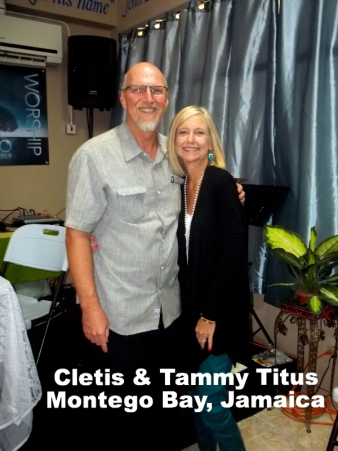 Help Cletis and Tammy see Your glory and never let them get over each encounter with You. God continue to use the Titus’ and expand their ministry as You desire. God, use them and empower them to do amazing things for Your glory.